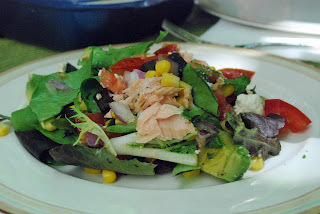 In the heat of summer, my mother would always prepare a nice salmon “Cobb” salad for us to enjoy at the kitchen table; one of our go-to light dinners in warm weather. It’s easy to prepare, light enough for summer and hearty enough to be a full meal. Somehow the combination of grilled salmon, avocado, juicy tomatoes, and sweet corn really does the trick. These days, I try to buy the salmon pre-grilled, because, really, who wants to cook in this heat? 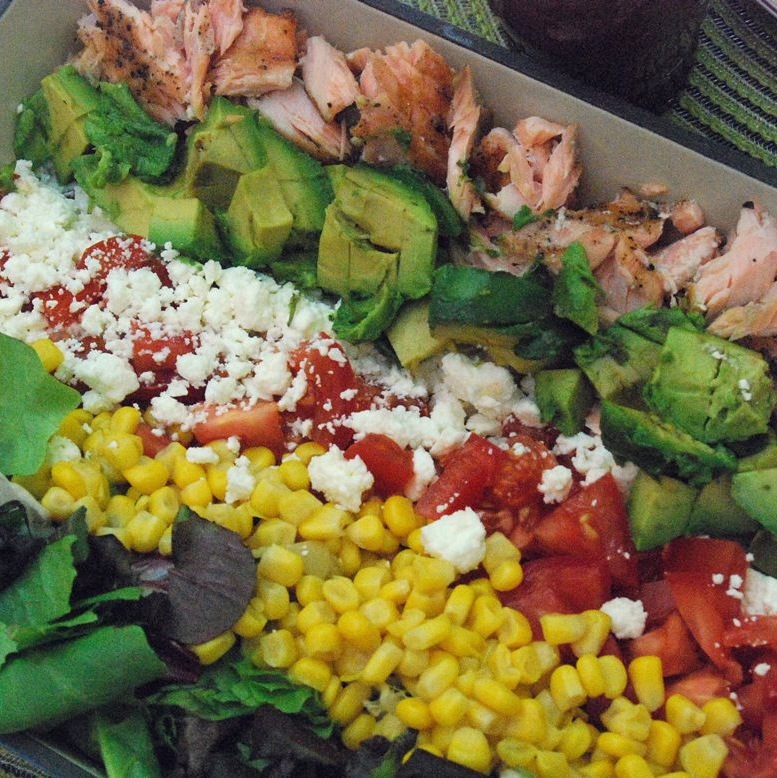 I put “Cobb” in quotation marks because my salad deviates a bit from the classic. 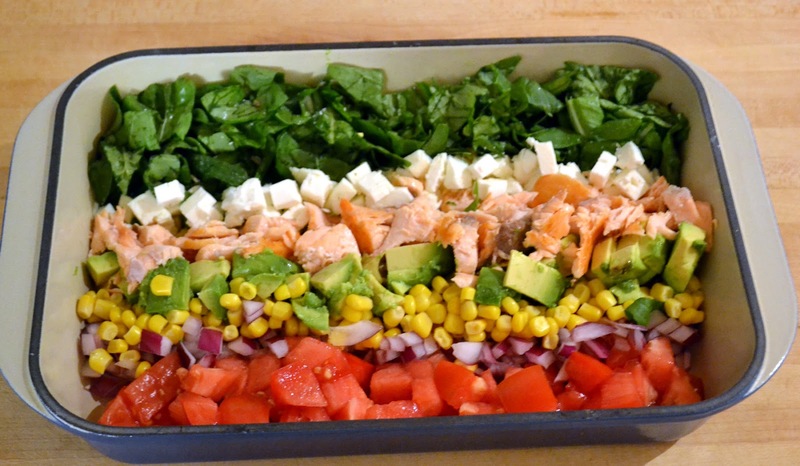 But I still arrange the ingredients in straight lines, which is essential. To serve, take a big fork and spoon and scoop in a perpendicular fashion to sweep in some of each ingredient. I think Mr. Cobb would approve. Serve with a simple vinaigrette, recipe below. Remember: store-bought dressings are a scam made up by the dressing industry to trick you into giving them money for something you can make yourself in about sixty seconds. Theirs are full of water, chemicals and bland oils and don’t even taste good. Yours are full of delicious. 1. Chop everything: Roughly chop the greens. Chop the tomatoes. Dice or crumble the feta. Dice the avocado. Thinly slice the onion. Flake the salmon. Chop the bacon and egg, if using. If your corn is fresh, cut the kernels off the cob with a sharp knife. 2. As you prepare each ingredient, arrange it in a line on a platter or in a rectangular baking dish. If you’re feeling artistic, alternate colors. Keep going until you have a line of each ingredient. 3. Make the dressing. Place the mustard in a bowl or measuring cup with a sprinkling of salt and pepper. Whisk in the vinegar. Then drizzle the oil in slowly, whisking the whole time, until a dressing forms. You can also use a shaker or, if you want a more emulsified dressing, a blender. Feel free to add herbs, spices, shallots, honey, etc. Mom always adds minced fresh garlic. Store the leftover dressing in the fridge.